Since 2000 and the opening of the 1st X-TREME STORES in Piraeus, until today, thousands of people who wished to improve their health and everyday living through exercise and proper nutrition, found their ideal space. 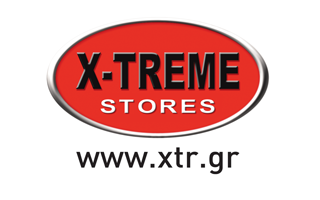 In all this course, X-TREME STORES, still holding their Greek, traditional identity, they still keep evolving. Now, by a quick surfing in our site, you can search and select through thousands of different products for training and nutrition, while at the same time you can visit one of the 53 stores in Greece and Cyprus to live a different experience in proper designed spaces, made to meet your every need. The huge, owned, multispacer that houses the warehouse, the technical dpt and the offices is the biggest proof that we have everything. Besides just a simple surfing in our site will convince you that our wide range of products cannot be found elsewhere. More than 150 employees in X-TREME STORES feel that they belong in a big family that its main target is to be next to you. Think that you have not only one but many training partners. People who will motivate you, will suggest new ways of training and dieting, will show you some new stuff but will learn from you. But most of all: They will listen to you! Forget all the anonymous contact. X-TREME STORES have a name. They are Nikos, John, Jim, Maria, George and many more who will make your path to your success easier, safer and funnier. The best way to find what you are looking for is personal contact. Through a big chain of stores you can get in personal touch for everything you want. Otherwise there is Live Support contact, social media or just pick up your telephone. There will be always someone to answer. Do you trust some other company more than X-TREME STORES? Well, that can be the greatest help for us. We want to learn from you. Tell us what can we improve and make better. We will try harder to get better and earn your trust.